This is one of my favorite recipes from Jamie Oliver’s cookbook The Naked Chef, with some alterations. A large cast iron skillet is very handy for putting this together and it can be a reasonably efficient process, especially if you’ve already got the tomato sauce prepped. Use a food processor to make your breadcrumbs with your two slices of bread. In a big bowl, add the bread crumbs, dried oregano, cumin, chilli, rosemary, egg yolk, ground meat, 2 tsp of salt and some ground pepper. I often like to add some finely chopped red onion too. Mix it all up with your hands and roll into meatballs (I usually make them 1.5 or 2 inches in diameter). Heat 3 or 4 tablespoons of olive oil in your cast iron skillet over medium high heat. If you want to check whether it is hot enough, add a few drops of water and if it immediately pops and crackles then it is ready. Add a batch of meatballs and brown them all over, turning them with a set of tongs. Be gentle so that you don’t break them up. If you only have enough meatballs for one layer in the skillet, add in enough tomato sauce to cover, your fresh basil (tear up the bigger leaves), and add some chunks of mozzarella cheese and grated parmesan. If you have more meatballs, you might do this in two layers. Cook in oven for 15 to 20 minutes, until cheese is golden. In a thick bottomed pan cook the garlic in the 2 tbsp of olive oil on low heat for a minute or two until golden, then add chilli, oregano and tomatoes. Mix gently — Oliver suggests letting the sauce cook for a while before breaking up the tomatoes so the seeds stay inside. Bring to a boil and gently simmer for an hour. Add the vinegar, then stir and chop up the tomatoes with your wooden spoon (they should be pretty easy to break up). Add your fresh basil or marjoram, add another 2-3 tbsp of extra virgin olive oil. (Frankly, I just use virgin olive oil throughout, rather than two kinds). Summer Sundays are great for catching up with friends for lunch on our Rye deck. A perfect day sees the kids tearing around playing havoc with the toys while the adults relax under the umbrella enjoying beers and lunch. 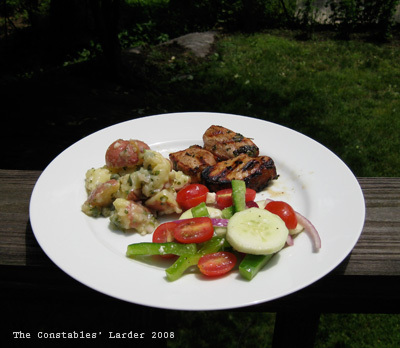 The hot weather at the moment is just right for salads and grilled meats – fresh flavors and mostly cold food. Today, we had a delicious grilled marinated pork, french style potato salad (without mayo) and a greek-ish salad of cucumber, peppers, cherry tomatoes, red onion and feta cheese. Pork marinade: Apple cider vinegar, coriander (cilantro), jalapeno peppers and a dash of soy sauce. We marinated the meat overnight and then grilled on the BBQ. Potato salad: Boil small red potatoes until tender. 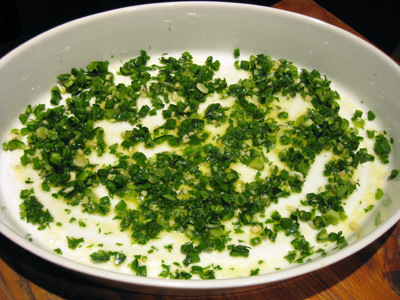 Meanwhile mix dressing – minced shallot, parsley, 1/4 cup of white wine vinegar, 1 tbs Dijon mustard; whisk together while adding about 6 tbs olive oil in a stream; finish off with a couple of teaspoons of capers. Dice the cooked potatoes and mix with dressing while warm so they soak it up. Eat warm or refrigerated. I winged this one early evening several weeks ago, inspired I think by a picture in a Jamie Oliver book for a different recipe. This is my attempt to remember what I did. The results were quite nice, with the fennel almost melting and the pork roast cooked inside a blanket of a kind of stuffing. Preheat oven to 310 F. Peel your 2 garlic cloves and slice into slivers. With the tip of a sharp knife, poke holes around your pork roast and tuck the garlic slivers inside. In a dutch oven, heat up some olive oil on high heat and sear the pork on all sides for a minute or so each, then remove and turn off heat. Place the fennel bulb pieces in the bottom of the dutch oven, leaving a bit of a dip in the middle to hold the roast. In a food processor, pulse up the bread, olives, walnuts, fennel seeds, and a pinch of salt and pepper. Take this paste and thickly coat the pork roast with it, then place the roast on top of the fennel, and pour the white wine around. Grind some salt and pepper on the fennel, cover, and pop in the oven for a slow cook. After an hour, flip the roast carefully so you don’t wreck the coating, and gently stir the fennel. Continue checking the pan and stirring the fennel every 30 minutes or so. If it is dry at the bottom of the dutch oven, add a little more white wine or water. Cooking time will depend on the size of the roast, but expect 2 or 3 hours (I usually check by testing firmness of the roast). I winged this one evening in London many years ago and it was a hit. It’s a great, easy way to whip together a tasty pork dish when you don’t have access to a grill (my preferred method of cooking ribs and chops). The medium cooking temperature will help keep the pork moist, but you want to try to not let it overcook. I prefer to make this with pork chops, but the pictures were actually taken from a meal where I used country-style pork ribs. 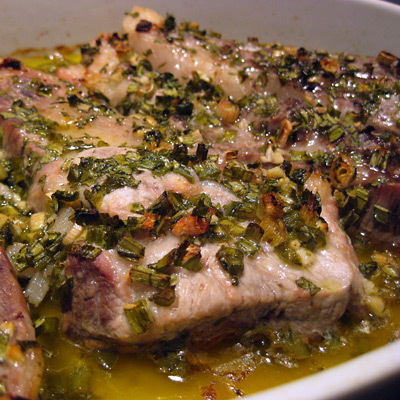 In a baking dish large enough to hold all the pork chops, coat the bottom with a thin layer of olive oil. Create a bed of the following: chop up half of the spring onions deep into the green part; mince the ginger and use half; halve, seed and chop up the hot peppers and use half; finely chop the cilantro and use half. Next, wash and dry the pork chops and score both sides with a sharp knife in a criss-cross fashion, which helps the marinade penetrate. Lay the chops on top of the base and add some salt and pepper. 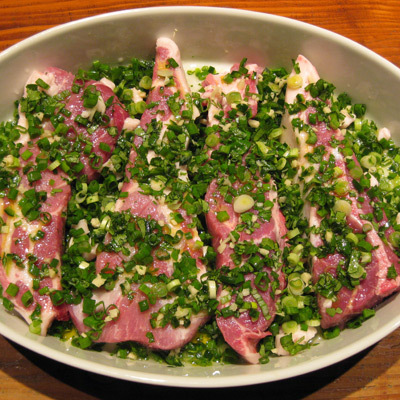 Distribute the remaining spring onions, ginger, cilantro, and hot peppers over the top of the pork chops. Pour cup white wine vinegar over the pork. Optional: you can also pour over 1/4 cup of white wine or vermouth. Ideally, you have time to let this marinate for a while but it is not absolutely necessary. If you want to marinate for a long period, cover with plastic wrap and place in the fridge. Place in the oven and cook at 350 F. Cook until the chops feel firm, which usually takes about 40 minutes to an hour depending on the thickness of the meat. If you are unsure about how firm the pork should feel, you can cut into one to see how well done the middle is, and remember that when you remove the pork it will continue cooking in its own juices for a few minutes. Optional: turn on the broiler for a few minutes at the very end to brown the top. In London, we lived across the street from Lidgate, a marvelous butcher, and I started cooking pork for the first time. I believe the keys to good pork are timing and marinade. One recipe I saw brined pork chops in pickling spices. I simplified into this concoction. » Wash and dry the pork chops, lightly score both sides, and place on a baking tray. Smear both sides of pork with mustard, olive oil, vinegar, parsely, onion, and a sprinkling of salt and pepper. You can also add a splash of vermouth or white wine to this. » Squeeze lemon juice over the pork and flip chops until both sides are reasonably covered with the marinade. Spread the parsely and onion on and around the chops. Let sit for 1-2 hours out of refrigerator, or overnight in the fridge. » Preheat oven to 425 degrees (or broiler) and slide tray in. Depending on how thick your chops are, they should only need a few minutes to cook on each side. Cut into one to check for color — if the chops are still pink inside, they need just a few minutes more. Try not to overcook. Note: I have also cooked this for longer under a lower heat like 350 F. The timing can be tricky to get right, but it can leave the pork nice and juicy if you don’t let it overcook. I think I snagged this, or something resembling this, out of a magazine but it was too long ago to remember where. » Score the beef and let sit in a marinade of soy sauce, sesame oil, ginger and hot peppers. Broil it until medium to well-done. » In a large bowl, combine the tomatoes (cut into wedges), cucumber (de-skinned, halved and sliced finely), red onion (halved and very finely sliced), lettuce (washed, dried and torn into small pieces), and a hefty bunch of cilantro (loosely chopped). » In a small mixing bowl, create the dressing by combining: fish sauce, lime juice, soy sauce, 2-4 tbsp fresh minced ginger, serrano peppers (halved, seeded and finely chopped), sesame oil, and for a bit more kick, I sometimes add in a touch of Rice Wine Vinegar. » Finely slice the beef (and halve the larger pieces), add to salad and mix in dressing. Let the salad sit for a bit so that the beef marinates further in the dressing. This is my version of Shepherd’s Pie, inspired by a recipe in the Dean & Deluca cookbook. I almost always cook this with ground beef, and the amounts below can be totally altered depending on your whim. I prefer to make this in a flat cast-iron skillet with decently-high sides that can be placed directly into the oven, but of course you can create this in non-oven-ready pots and combine everything in a baking dish. » Drain potatoes and mash. Add 2 tbsp butter, 1 tsp salt, 1/4 tsp pepper (parsley optional here). Add milk (may need more or less than 1/2 cup depending on amount of potatoes) to the point where potatoes are moist but not yet liquidy. » Cook bacon thoroughly in a touch of olive oil in a large cast iron frying pan (or whatever pan you have). Remove from pan and drain most of the bacon grease. » In same pan, brown the ground beef over moderate heat and season as you cook with 1/2 tsp salt, rosemary, and worcestershire sauce. Once browned, sprinkle with flour, stirring the flour in and let cook for another 4 minutes. Remove meat and drain excess grease from pan. » If you are using a cast iron pan, your meat and vegetables are already in the pan as the bottom layer. Otherwise, move the mixture to a baking disk. Cover with the mashed potatoes. Smooth the top (easier with a fork, which also lets you make fun patterns) and bake in the oven, uncovered, for 40 minutes until heated thoroughly. I will often turn the heat way up at the very end to brown the top just a bit.